A Non-Profit Organizational Chart is basically an Organizational Charts which is also referred as an organization chart or an org chart, also known as organigram(me) or an organogram but pertaining to NGOs or a particular Non-Profit Organization. It typically illustrates the relation that exists between the people of an NGO. These could range from directors, managers to sub workers and right to the level of volunteers. 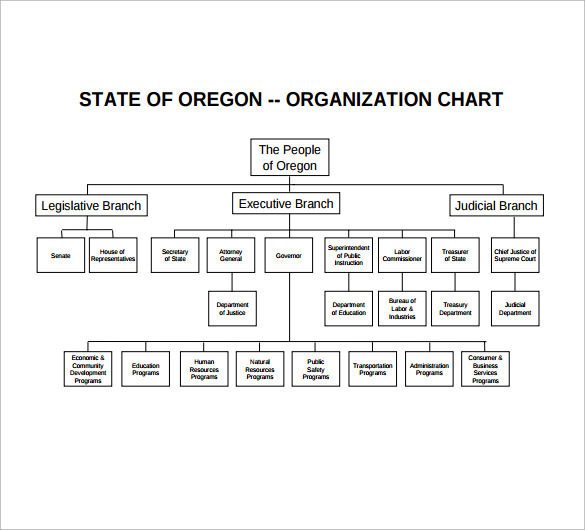 Our Non-Profit Organizational Chart is available in various formats like PSD, etc. If needed there can be a PDF version as well. We can even arrange for a word file in case that is more convenient. There are several members involved in the management of a non-profit organization. Volunteers play a very important role in such an organization. So, use this template to position your board of directors, staff members and volunteers at the right places. This template showcases the traditional structure of a non-profit organization. Board of directors makes a number of committees to which the CEO of the organization is answerable. The CEO then manage a number of other staff members including the Asst. Director, CFO, COO and others to get things done. Download this template to know how to traditionally organize your staff members to run a non-profit organization. 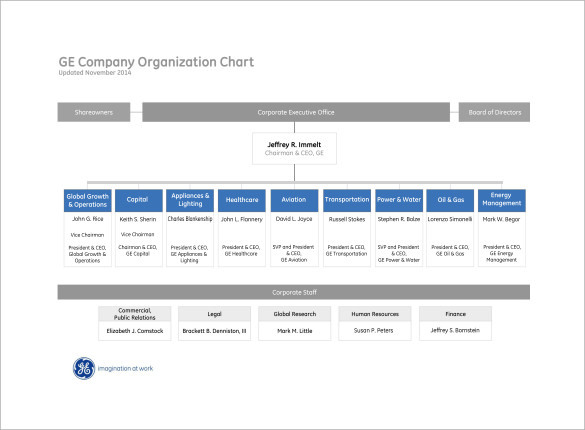 With the help of properly placed boxes and titles, this template makes your organizational chart easy to read and understand. There are three categories of the organization, about what it should look like, what it does look like, and what it could look like. 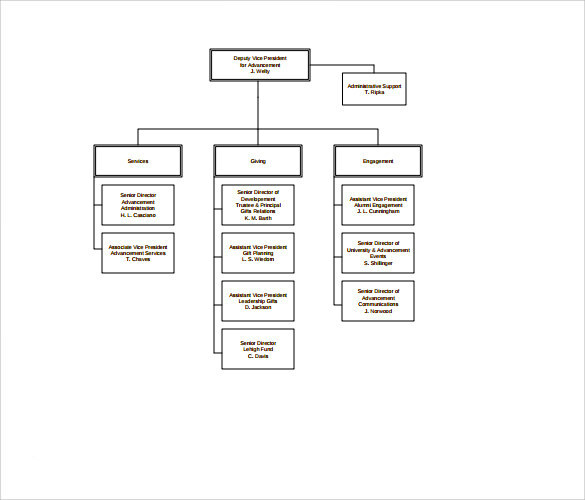 Fill in the necessary details to make this organizational chart specific to your organization. 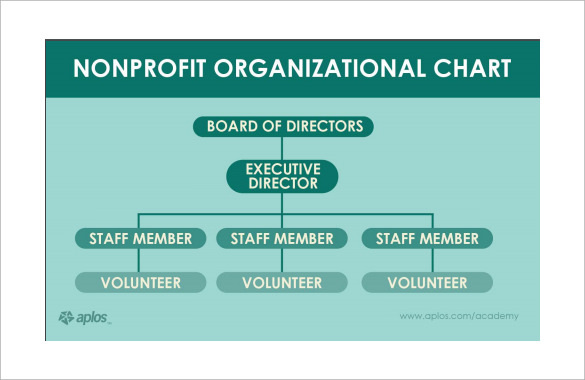 This printable non-profit organization chart template is a simple, easy-to-use and understand, traditional type of organizational chart that is followed by a majority of non-profit organizations. With the help of a few boxes, lines and arrows, it helps in creating a fully functional, error-free organizational chart for your institution. Why Do You Need a Non-Profit Organizational Chart? If you are looking to design an all-inclusive and successful organizational chart for your non-profit institution, then look no further than these organizational chart templates. These versatile organizational charts can adapt to a wide range of organizations, and provide you with a user-friendly interface. They are extremely helpful in maximizing your organization’s performance, providing to your clients that your organization values attention and quality to detail. As far as customization is concerned, these organizational chart templates are 100% customizable as per your individual needs and preferences. You may like Basic Organization Charts. 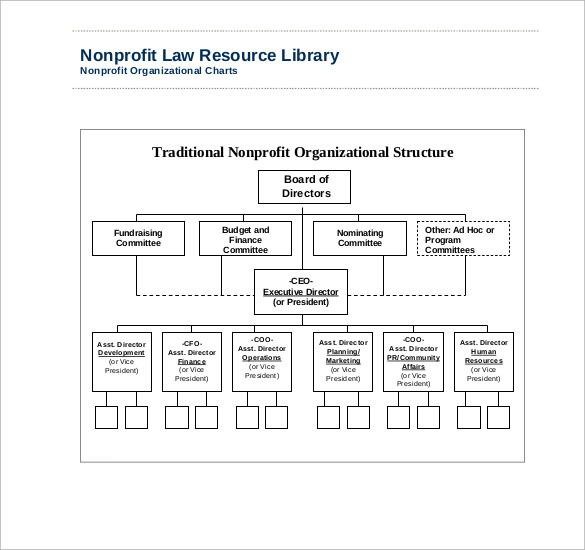 When Do You Need a Non-Profit Organizational Chart? 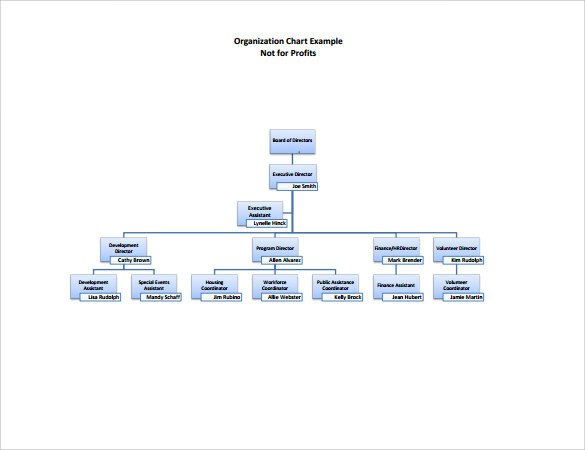 With these non-profit organizational chart templates, you can distribute your staff members in an organized manner. These templates are simple and streamlined to provide you with a whole lot of personalization tools and options. These are products that may accommodate almost any kind of user, no matter whether you have any technical skills in the field or not. These templates facilitate creation of a full-fledged organizational structure, providing you with an opportunity to maximum your revenue and popularity. You can also see Horizontal Organization Charts. When you have a good organizational structure, you can significantly enhance the success and reputation of for your non-profit organization. The installation process of these templates is easy and quick. They have a user-friendly interface which any novice can effectively get used to. Any staff member can tailor these templates and create a structure that best matches your organization. These are beautiful and professionally designed organizational charts that can actually enhance your organization’s management. You can tailor them as per your needs, and showcase your organization past any expectations. They offer impressive design and structure to create any non-profit organization chart.